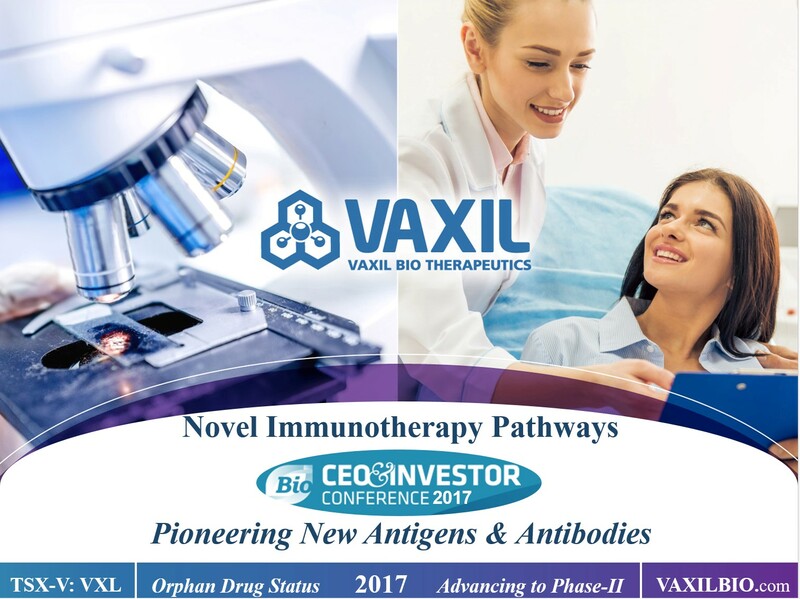 NESS-ZIONA, ISRAEL and TORONTO, ON–(Marketwired – February 09, 2017) – Vaxil Bio Ltd. (“Vaxil”, or the “Company”) (TSX VENTURE: VXL) today announces its participation in the Annual BIO CEO and Investor Conference. Vaxil’s Dr. Limor Chen will present an overview of the Company’s R&D and clinical strategy in regard to its immunotherapy products. Now in its 19th year, the BIO CEO & Investor Conference is one of the largest investor conferences focused on established and emerging publicly traded and select private biotech companies. Immucin™is thought to target antigens via novel mechanism acting as a neo-antigen. Vaxil has recently begun testing combination options with data suggesting potentially complimentary synergies with checkpoint inhibitors and IMiDs. Phase-I/II successfully completed, with Orphan Drug Designation, Vaxil is currently planning for a larger Phase-II. Antibody platform believed to be more targeted and specific against antigens specific to tumor cells while simultaneously avoiding soluble antigens found in normal cells. Superior immunity demonstrated in tuberculosis patient samples vs current vaccines, strong and specific cellular responses, recently granted US Patent. Vaxil is a cutting edge Israeli-Canadian immunotherapy focused biotech with its R&D based in the Weizmann Science Park, Israel and listed on the TSX-Venture. Vaxil specializes in the development of immunotherapy products for the treatment of cancer and infectious diseases by activating the patient’s own immune system, including nearly 10 years of R&D and a robust patent portfolio. Vaxil immunotherapy products are based on its VaxHit™ platform, a proprietary algorithm for identifying, isolating, and producing signal peptide specific immunotherapy products believed to target prominent markers via novel mechanism. The first product developed through VaxHit™ is known as ImMucin™, a therapeutic cancer vaccine, which received Orphan Drug Designation from both FDA and EMA. ImMucin™ was generated to target the signal peptide of MUC1, a prominent antigen found in 90% of cancers yet to date unresponsive to other therapies. Vaxil believes Immucin™ acts via novel mechanism as a neo-antigen. Recently, Vaxil has shown that ImMucin™ can potentially elicit a strong anti-tumor activity when used in combination with checkpoint inhibitors. In a Phase-I/II, 100% of patients demonstrated robust immune responses, with the majority of patients achieving stable disease, and the Company is now planning for a larger Phase-II. Vaxil’s antibody platform, known as SPmAb™, are the first-ever signal peptide specific antibodies. The Company believes its antibodies possess several key advantages, including the targeting of cancer at its earliest stages. To date, SPmAbs™ have been shown to induce anti-tumor activity in mouse cancer models. In addition to oncology, Vaxil has developed and patented MTbuVax™, a novel TB vaccine, which has demonstrated superior immunity when compared to currently available vaccines. Vaxil believes the field of infectious diseases to be particularly important given the rise of super-bugs, antibiotic resistant strains of infections, including the World Health Organization reporting a rise in people developing multi-drug resistance to tuberculosis. To date, Vaxil has demonstrated both in human samples, as well as in mice, that its various MTbuVax™ candidates have potential to elicit stronger, more specific immune responses. Disclaimer: The TSX Venture Exchange Inc. has in no way passed upon the merits of the Company has neither approved nor disapproved the contents of this press release. Neither TSX Venture Exchange nor its Regulation Services Provider (as that term is defined in the policies of the TSX Venture Exchange) accepts responsibility for the adequacy or accuracy of this release. This news release contains forward-looking information, which involves known and unknown risks, uncertainties and other factors that may cause actual events to differ materially from current expectation. Important factors – including the availability of funds, the results of financing efforts, the results of exploration activities — that could cause actual results to differ materially from the Company’s expectations are disclosed in the Company’s documents filed from time to time on SEDAR (see www.sedar.com). Readers are cautioned not to place undue reliance on these forward-looking statements, which speak only as of the date of this press release. The company disclaims any intention or obligation, except to the extent required by law, to update or revise any forward-looking statements, whether as a result of new information, future events or otherwise. This press release does not constitute an offer to sell or a solicitation of an offer to sell any of the securities described herein in the United States or elsewhere. These securities have not been, and will not be, registered in the United States Securities Act of 1933, as amended, or any state securities laws, and may not be offered or sold in the United States or to U.S. persons unless registered or exempt therefrom.